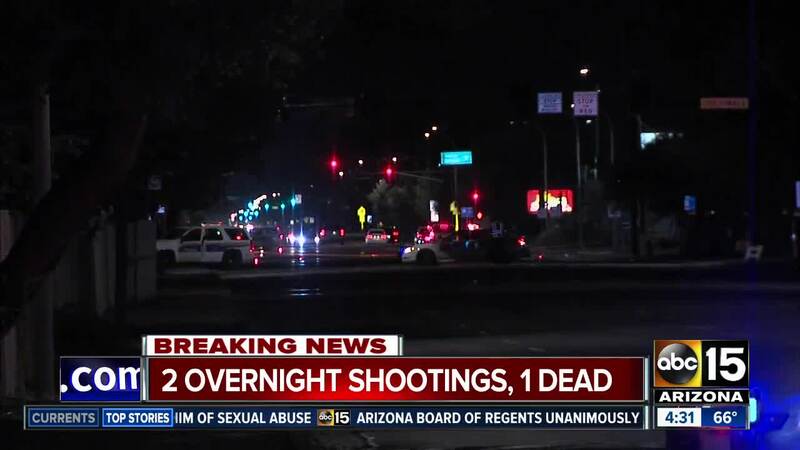 PHOENIX, Ariz. — Phoenix police have identified the suspect accused of killing four people, including two young girls, in a shooting Thursday night. Austin Smith has been arrested and charged with killing his wife, two of his children and another man. Officers first responded to a neighborhood near 69th Avenue and Osborn Road around 8:15 p.m. for reports of a shooting. At that location, police found a 46-year-old man, later identified as Ron Freeman, who appeared to have died from gunshot wounds. Shots were still being fired when officers arrived, according to Sgt. Tommy Thompson. A 47-year-old woman had also been shot multiple times, and was taken to the hospital in critical condition. A second adult male was located with a gunshot wound, and was taken to the hospital in stable condition. Officers learned Smith was in a vehicle that had just left, which they stopped near 67th Avenue and Osborn Road. He was taken into custody without incident. Information gathered at that scene led police to a home near 67th Avenue and Camelback Road, where police found the suspect's 29-year-old wife, Dasia Pattersonn deceased. Police also found the couple's 7-year-old and 5-year-old daughters, Mayan and Nasha Smith, dead at the home. Smith's 3-year-old daughter was found unharmed, hiding under a bed. Police say Patterson and Nasha Smith were shot, while it appeared Mayan died of blunt force trauma. Investigators said autopsies would conclusively determine the cause of their deaths. "He was very outgoing, he made sure that everybody knew him, he spoke to everyone here. He got along with everyone, laughing, had conversations, joking but the wife was always inside," Carmen Gallego said, who lives near the suspect's home.